Now with a stylish gear hat. AUTO GB1: [Rest this unit] When this unit is placed on R from the deck by a time leap, you may pay the cost. If you do, draw 1 card, choose 1 of your other units, and it gets Power +4000 until end of turn. Today’s card we’re introducing is a Grade 1 《Gear Chronicle》 Unit from the Clan Booster”Gears of Fate” (on sale September 30th, 2016), “Steam Maiden, Meskia” whose ability shows itself when she’s placed on the field due to 【Time Leap】. 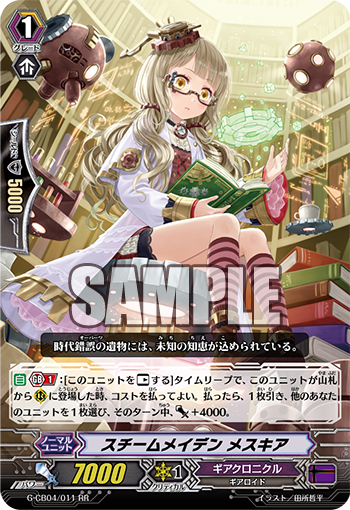 “Steam Maiden, Meskia”, when she’s placed onto the field from the Deck due to Time Leap, can use herself as the cost to draw 1 card! The cost is she Rests herself, but that’s virtually the same as no cost at all. This effect also grants 4000 Power, creating a baseline 11000 line. Compared to “Steam Scara, Jiji”, in terms of Power and Cost, you shoul consider which is better for your Deck. The ability of “Meskia” has the activation condition of “Being Called from the Deck”, so kee[ in mind, when she’s Called from a Time Leap ending at the end of the turn, her effect won’t activate. The return to the Deck effect is one of the oddities of Gear Chronicle, so it’ll be fine even if you only include 1 copy of “Meskia” to your Deck. Even if you unintentionally draw it, you can return it back to the Deck with “Steam Battler, Ur-Watar”! Finally “Gears of Fate” and “True Zodiac Time Beast” go on sale this upcoming Friday. Check out the cards already shown, and get ready to enjoy fighting with a brand new Deck!